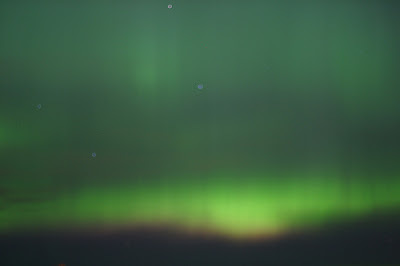 ABOVE: The auroral display of December 14, 2006, as seen from North Dakota. Thanks to Jason Paul Smith for taking this photograph and posting it (along with many others) to the Creative Commons section of Flickr. My father called me around 6:45pm to tell me to hurry up and go outside. He was on his way home from work and reporting a spectacular auroral display from the countryside near Sycamore, IL (41°N & 88°W, 60 mi west of Chicago). I didn't manage to get any details from him other than that there were curtains fading in and out, and that he could even see them through the light polluted skies of some of suburbs along the northwestern horizon. Here in Urbana, IL (150 mi south of Chicago; 40°N, 88°W) I headed out to a site with access to a clear & dark northern skyline (north Lincoln Ave.) around 7:00pm. It was evident even before I could pull over that the entire northern horizon was aglow with pale green. For the first fifteen minutes or so, looking due north I could see a few small curtains of green fade in slowly (over the course of 1-2 minutes each) and fade out again. They did not extend more than 15 degrees above the north horizon. Then around 7:30pm, there was an outburst of more intense activity. Several beautiful and much more rapid green curtains, followed by some long "rays" of green extending as far as 25 degrees above the horizon, and added to this a large patch of red appearing off to the northwest in the head of Draco. I had to leave at that point, but I returned around 8:30pm, only to find that the northern horizon had returned to being just a pale green glow. This was my third or fourth display from central Illinois that I've personally seen, and of these experiences, the best yet (for me anyway). Much thanks to Mark Haun's email list for the heads up (for more information, see previous post).